What does “Unsupported” actually mean? – Easy, doing it on your own without any help right? Well the more one explores the concept, the less black and white it appears. Take for example meeting a stranger on your travels. They offer you a drink or they talk about the local area, the roads, the traffic or the weather. Such a meeting could have negative, zero, or positive effects on one’s race. Refusal to engage or accept their generosity could offend. Time spent chatting is time not putting the miles on the board. Its a valuable travelling experience but to the racer it could be seen as time wasted. On the other hand the timing of a glass of water, a meal or nugget of information could also be pivotal. First hand knowledge of the nature of the local geology, road closures, weather patterns or services could also prove to be acutely invaluable if the circumstances dictate. To a large extent it is down to the individual rider’s aptitude to make the best decisions and balance the cost vs benefit of time off the bike for learning about the forward conditions or sustaining themselves with beneficial rest and nutrition. This resourcefulness is the mark of the experienced and able adventure cyclist and where individual distinctions are made denote an individual’s style. Where though does the line lie between acceptance of and reliance on the kindness of others? When does self sufficiency give way to the solicitation of assistance and when do we agree that two styles diverge enough that one offers a competitive advantage and whether another has a positive or negative effect on the racing context as a whole? Where, if anywhere, should the rule book give hard answers? For it is the character of the race and the sport as to whether common practice, culture and etiquette might assert enough influence on the actions of riders and followers, or whether race regulation must intervene. This year when entries opened we took the opportunity to find out the current state of understanding amongst TCR applicants. This was something of an entry quiz, those showing an acute understanding of the issues highlighted themselves as positive ambassadors for autonomous racing and were spared from the ballot. There were certainly good and bad answers. There weren’t however any wrong answers. The entry process had one major mandate, to promote thought and discussion on the nuances of unsupported travel. To discover what is already the common thinking and on what issues additional guidance might be needed. The questions were posed to riders under two main premises, though these clearly overlap: What is “Private Resupply?” and What is “Dedicated Outside Assistance?” In Part I we look at the first of these. The rules state that “equipment and supplies must be carried or found at commercial services”. These are methods of re-supply that are open to all competitors. If a racer has access to services and supplies that any other rider arriving at the same time in the same circumstances would most likely not have, then this is Private Resupply. It is the supply of equipment that is specifically for one rider at the exclusion of others and it is prohibited. Therefore we asked what constitutes Private Resupply? 1. 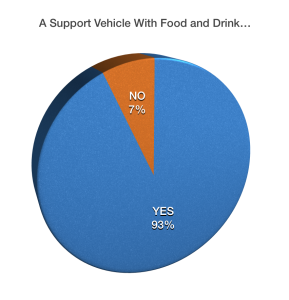 A support vehicle with food and drink. This is the obvious differentiator between supported and unsupported to get us started. We might consider this our “Control Question” and the 7% as our error in those who might have given blanket answers to all questions or misinterpreted the affirmative/negative premise of the question. There’s a clue in the question; “support vehicle” is not unsupported in anyone’s book. There’s no question about this one, its against the rules. TCR Verdict: Yes, this is most definitely private resupply. 2. Stopping off at my house to get spare parts. This is another one that should be rather obvious, there is nothing more Private Resupply than stopping at your own house and a large majority of riders agree. Some may consider that without an on-road support vehicle then the ride is un-supported and anything else is fair game and it would surely be tempting for those who live along the route to pop in for a cup of tea. With the best will in the world though no-one is going to open their house to serve all the riders equally. TCR makes an explicit judgement here, any rider going home during the race may as well stay there. Its totally against the rules, as is staying there or sleeping in the garden. TCR will have to live with the fact that some riders will know many of the roads and routes along the way, while others won’t. This is the benefit of experience and gaining experience is not against the rules. TCR Verdict: Yes, this is private resupply. 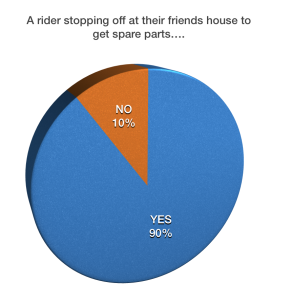 Curiously more riders answered yes to this being private resupply than their own home. Perhaps they see their friends as more supportive, or just less tempting. The same rules apply though, you already know them and if its a private address its a relationship which is not available to all the other riders, so its explicitly against the rules to take any resupply, services or accommodation there. Even friends meeting you at public locations is private re-supply if they bring with them any supplies or equipment or perform any service for you of any kind. It doesn’t have to be a private location to receive Private Resupply. 4. Stopping off at a Bike Shop to get Spare Parts. 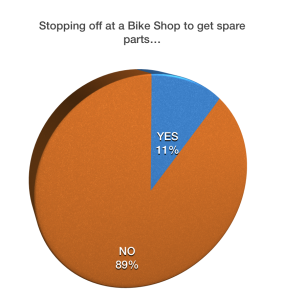 Totally OK this one and not Private Resupply, its what bike shops are for and that’s well understood by our riders too. If its a legitimate commercial business and you are not receiving any special treatment then its all good. TCR Verdict: No, this is perfectly OK and not private resupply. 5. Stopping off at my Friend’s Bike Shop after hours to get Spare Parts. Another one well understood by our applicant racers. 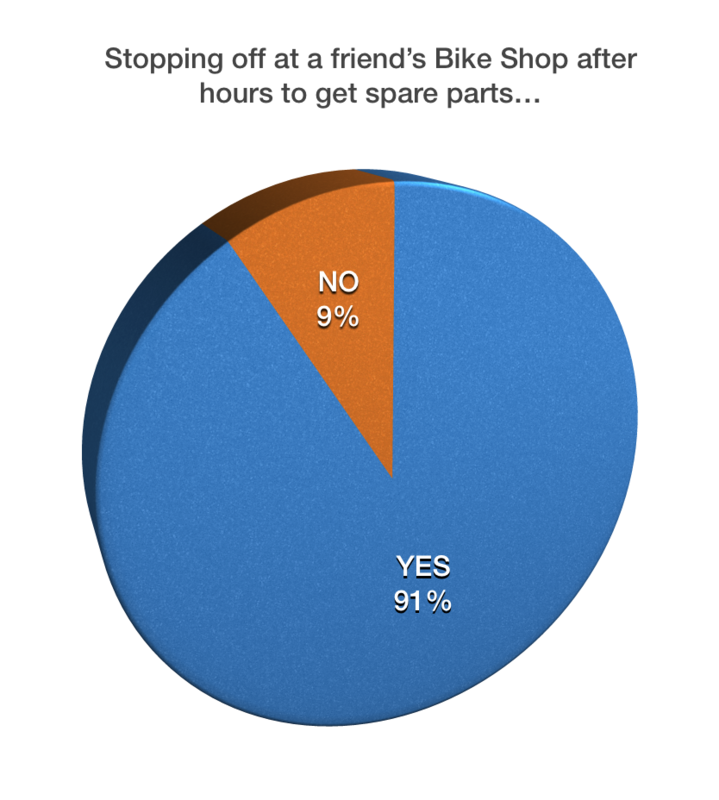 The issue is not that it’s your friend’s shop. If they are open to everyone then they are open to you too. What’s not OK is if they are open to you when they are not open to everyone else. 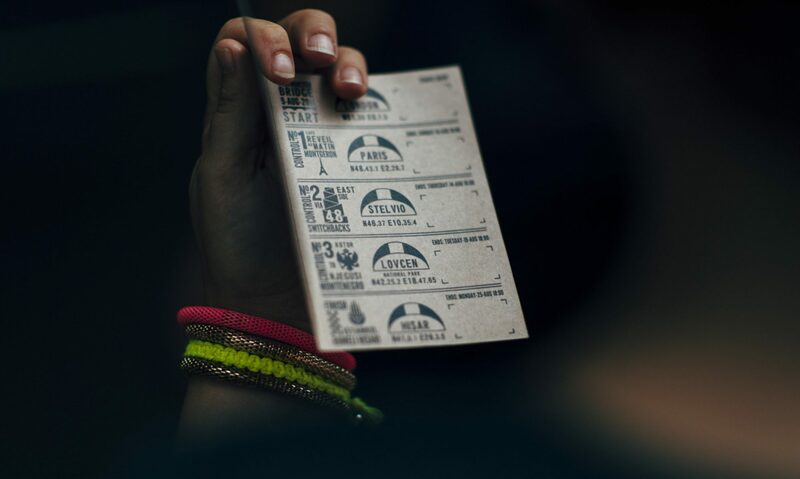 Sometimes bike shops along the route of well known unsupported bike races (such as the Tour Divide for example) will go to extra lengths to service racers by giving them food and water and helping with accommodation or by extending opening hours. This is OK to an extent but they must provide the same service to all racers, not just the leaders or friends of the shop. In the case of Transcontinental, we would always suggest that any bike shops who are aware of the passing of the race or knowingly serving TCR riders to make contact with the race, especially if they intend to extend their services outside of their normal operation. We would hope that bike shops would like to join us in promoting a fair race by being in good communication with TCR admin and so that TCR can help riders in need discover them. 6. Getting a bottle of water from a stranger. This is a more ambiguous proposition and one which divides our applicants more in their answers with 30% believing it to be a case of Private Resupply. On the whole it would be OK to accept such an offer. Other races, often off-road wilderness based events, might call this “Trail Magic” as it is essentially an unsolicited offer which is based mainly in fortune and usually deemed OK to receive. If the rider and offering party have no prior knowledge of each other or their meeting then its legit. If a rider is in dire need of water it would, as a last resort and having exhausted all reasonable commercial and natural sources, seek water from private individuals. However riders shouldn’t make a habit of begging for aid in this way and should not access private property uninvited. Transcontinental is not a wilderness race; water is plentiful along the route and it is the rider’s responsibility to maintain a good supply from legitimate sources. TCR Verdict: No, this is not private resupply. 7. Stopping for a Meal with a Local Family. Again our applicants are split on this one with a slim majority for the case that it is not Private Resupply. Here once more the important thing is that riders do not invite themselves or solicit such a gift, or that they do not have any prior knowledge of the meeting or the people. If it is a happenchance meeting and a kind offer we wouldn’t like to see racers pass up such an opportunity, but likely it won’t be the most expedient way to eat, so not a good habit for the front runners. It may also draw claims of foul play if it does look too good to be true so be careful with this one and if a race result is what you want, maybe keep this one for touring. 8. 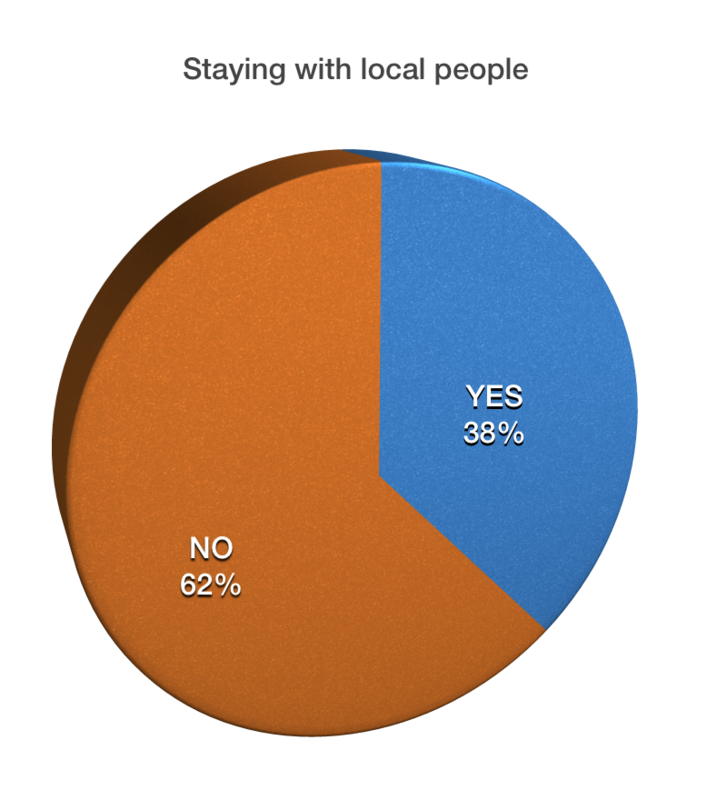 Staying with local people I just met. TCR would advise that racers don’t view local people as a standard accommodation resource. However this would not be expressly against the rules and as such could be accepted if offered provided it is completely unsolicited and not pre-arranged. You may be asked to prove it was legit if a race result hangs in the balance or there is a complaint made. Often such arrangements don’t gift themselves to the racer’s schedule and you may end up staying longer than you anticipated or finishing the days riding earlier. If truth be told its best avoided, unless you are just out for adventure and to have fun. In many unsupported races sending yourself an equipment drop is seen to be OK, but the condition is usually that you should only send it to an official post office. Sending a package to a hotel means you must have already pre-arranged accommodation, or at least an arrangement to pick it up, even if you weren’t going to stay there. Forward booking of such services is generally frowned upon as, if a racer were to have an inexhaustible budget, then they could send many packages to many hotels and have the pick and choose of what they pick up. This would change the landscape of the challenge significantly and be the preserve of the very well financed. As Transcontinental puts the accessibility of the race as one of its priorities it is important to us that there is not a means by which the TCR can become a war of resources. Also the Transcontinental is not the longest or remotest race out there, you should be able to find what you need most places. If you have a bespoke thingy-ma-bob that needs special parts, maybe think about if you really need it or can you make do with what everyone else has access to. If you can’t live without it, is TCR really for you? Most bike related things are readily available until you leave Italy and sending packages to any places further East can be a bit hit and miss in terms of delivery and often incur large duties. TCR makes the judgement that shipping of supplies is not within the rules. Temporary storage or jettison of major equipment and supplies is also prohibited. Any exceptions to this are at the express permission of the race director. Next time in part II we’ll look at the answers to the second question: What is Dedicated Outside Assistance?